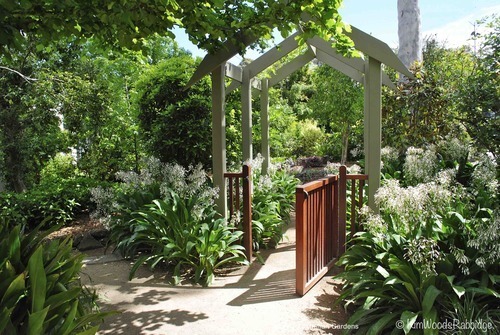 An open-framed lych gate, which echoes the home, defines the entrance -and is welcoming. 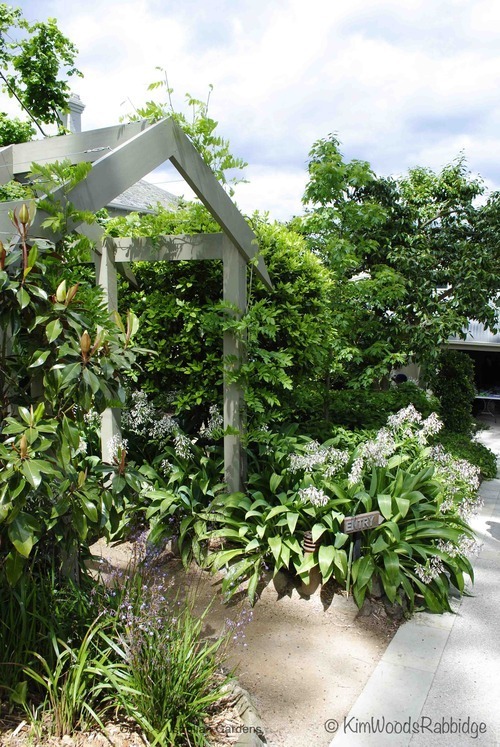 For over forty years Robert Boyle and his Landscape Design, Construction and Maintenance team have been involved with landscapes around Melbourne and Victoria. 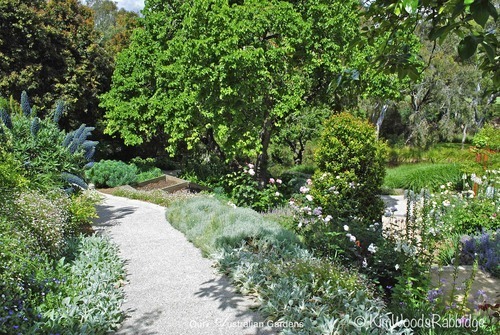 This garden renovation at Ivanhoe, under the guidance of Senior Project Manager, Garreth Le Page, was a project that coincided with work on the home – some parts of which date back to the 1800s. 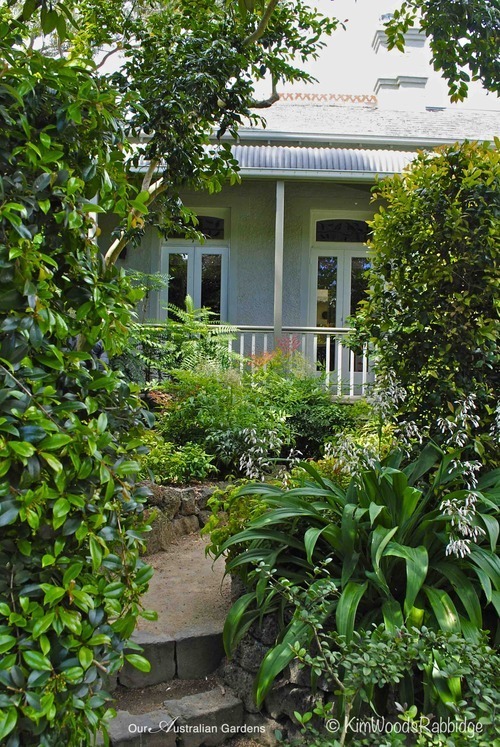 Both the home and garden were imbued with old world charm that Garreth and his team were keen to retain. At the back of the home, which faces south towards the Yarra River, living areas were renewed with multi-tiered decks that appear to reach out over the garden. 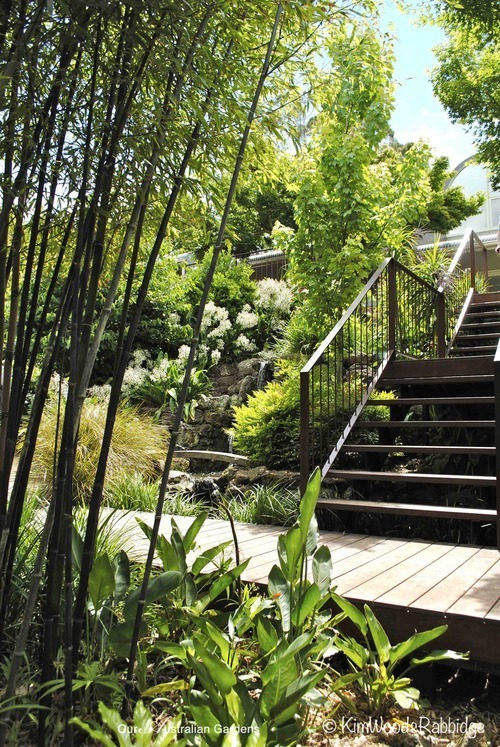 A timber boardwalk allows safe passage through areas that had previously been a little difficult to negotiate. 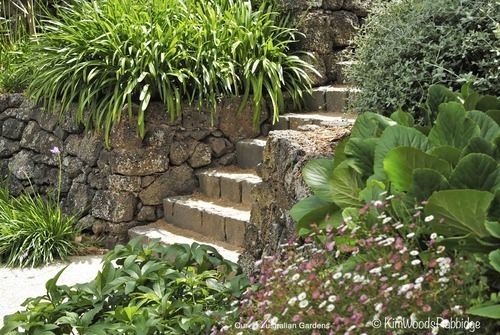 Raised walkways also reduce damage to tree roots. 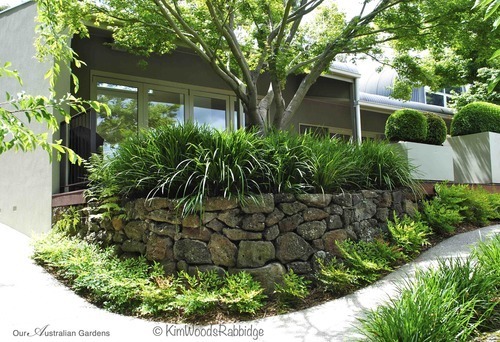 When the team first surveyed the site, they determined that existing features in the well-established garden, including basalt retaining walls, would be kept if possible, and enhanced where needed. 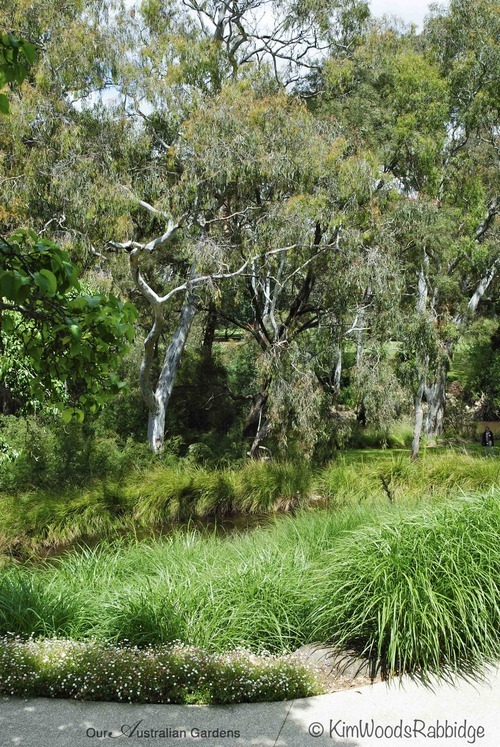 The property spills down quite steeply to the Yarra River where beautiful old river red gums star on the riverside stage. At night the trees look very sculptural when up lit. Beside the river, a man-made ‘billabong’ holds water harvested from the roof – but it’s aesthetic as well – and reflects the majestic gums. 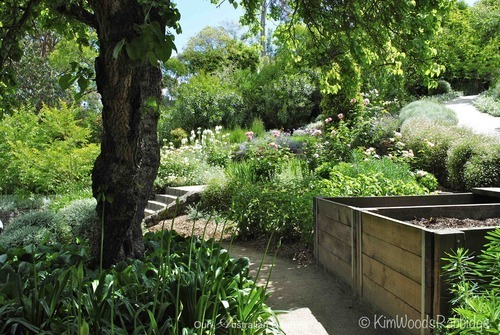 They took into consideration that the lower section of the garden sits below the 100 year flood line. 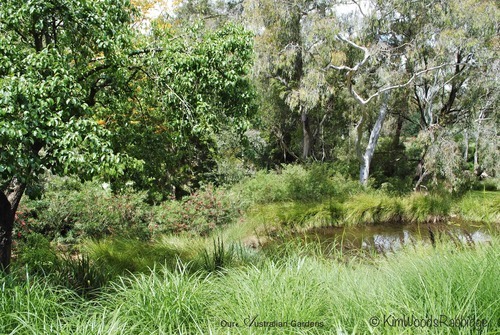 Mostly native plants, (especially those that survive occasional inundation) have been incorporated in this riparian area which is a mecca for wildlife. 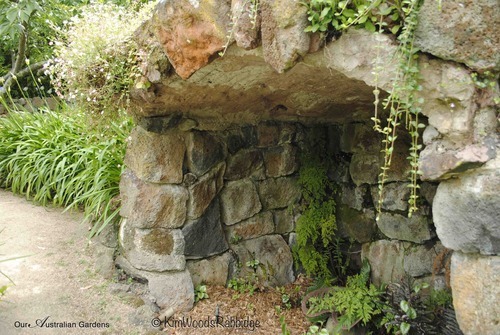 Ferns have naturalised in the ‘find me if you can’ grotto. 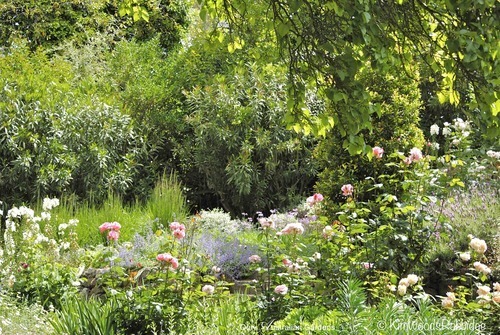 This garden is surely a children’s ‘dreamscape’. 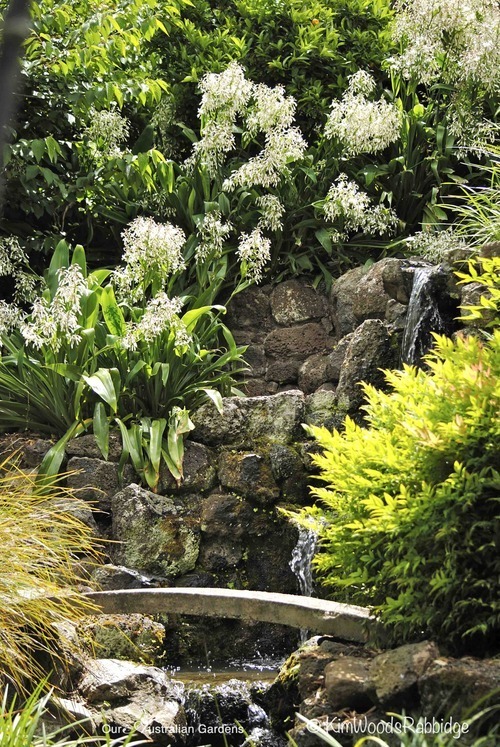 Falling water brings energy and liveliness to the garden as it reticulates down the terrace and beneath the boardwalk. This existing water feature was re-tanked and waterproofed, and the pumps upgraded. Set a little way down the hill, the new pavilion by the swimming pool now draws people to this area. Complete with BBQ facilities it’s a perfect place for entertaining, and the ideal perspective from which to appreciate views to the bottom of the garden and the river. 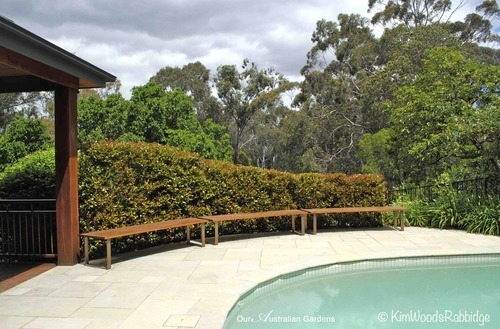 Poolside seating follows the curve which is further accentuated by a wavy hedge of Acmena ‘Firescreen’. 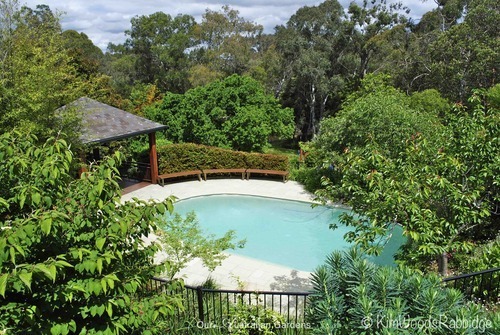 The pool equipment is housed discreetly below the wooden floor of the pavilion – out of sight. 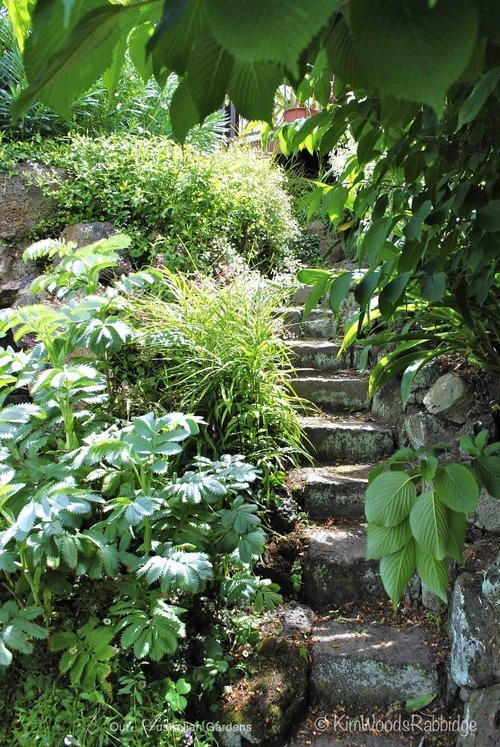 Stone steps and gravel pathways are bordered by low-growing tulbaghia and nepeta, and silvery foliage of stachys is highlighted by the sun. 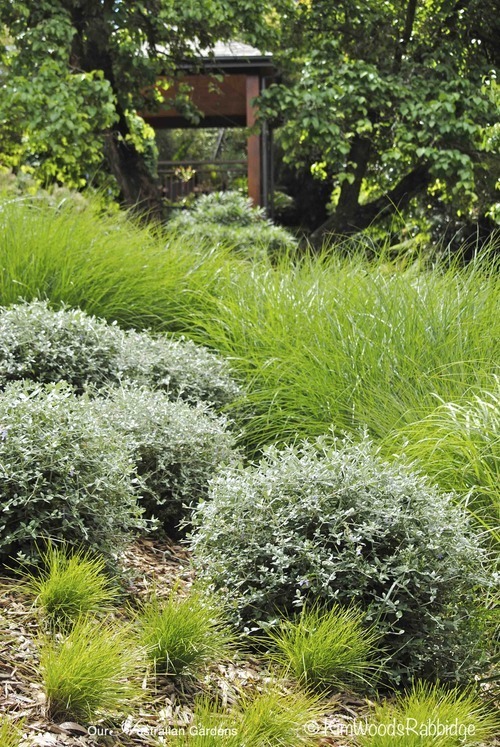 Undulations of lomandra ‘Little Con’, Miscanthus sinensis and perennials, such as trimmed teucrium, cover the hillside. 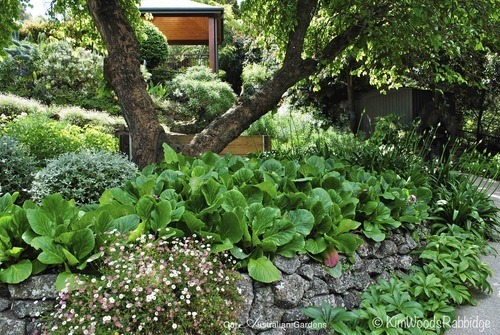 Sweeps of bergenia and hellebores accompany balls of tuecrium, and mounds of seaside daisies skirt the rock wall beneath a gnarled old mulberry tree. Compost bins have been placed centrally without drawing too much attention. 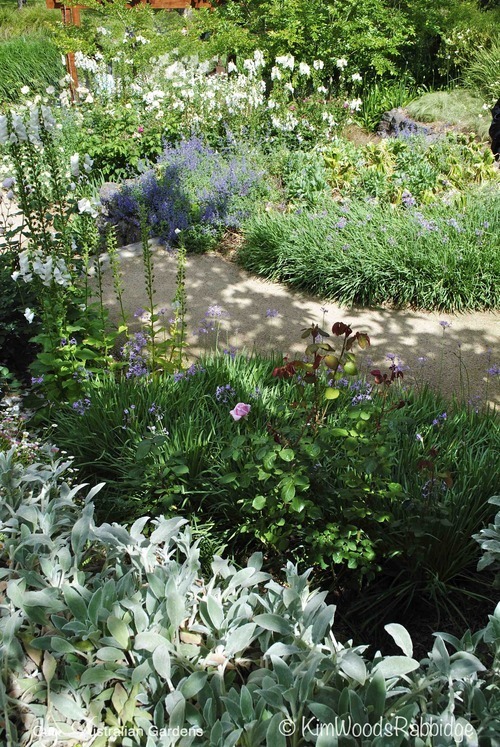 In late spring the garden is pure joy – brimful with scent, colour and texture from echium, euphorbia, roses, agapanthus and foxgloves. 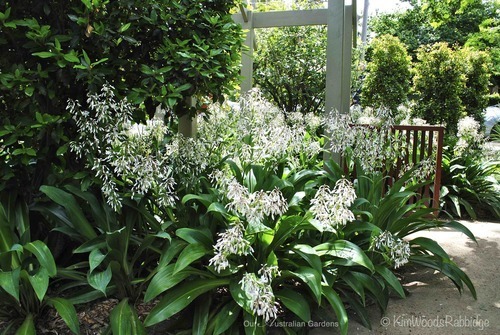 Masses of spectacular plumes of petite Arthropodium cirrhatum flowers spray from effulgent leaves. 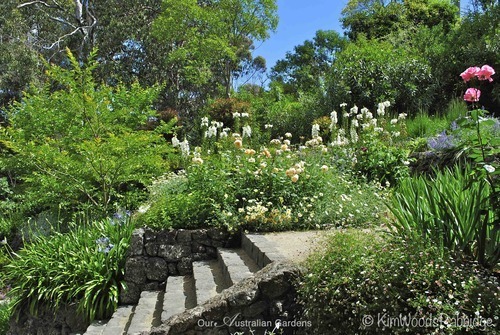 On every day, and on every turn along one of the many garden paths, new vignettes emerge to warm the heart. The photography is stunning, congratulations. That has to be the best coverage I have seen on gardens, congratulations and well done. 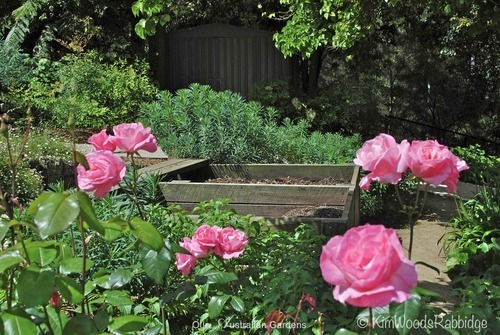 Thank you for sharing these wonderful gardens- great photgraphy! Thanks so much for your comment – glad you’re enjoying them! We’d love you to encourage your friends to follow us too.